As news organizations prepare for the future, they might be well-served to keep their eyes on an important demographic shift: In 2015, the Millennial generation — those ages 18 to 34, and born between 1981 and 1997 — is set to become larger than the Baby Boom generation. (This will be true, even as the country’s median age continues to rise.) Over the next three decades or so, the cohort of Baby Boomers will decline in size steadily, and by mid-century only about 1 in 5 will be living, as the Pew Research Center points out. Related research: Research involving anonymized online browsing data yields a very different picture among average news consumers, across all age groups. 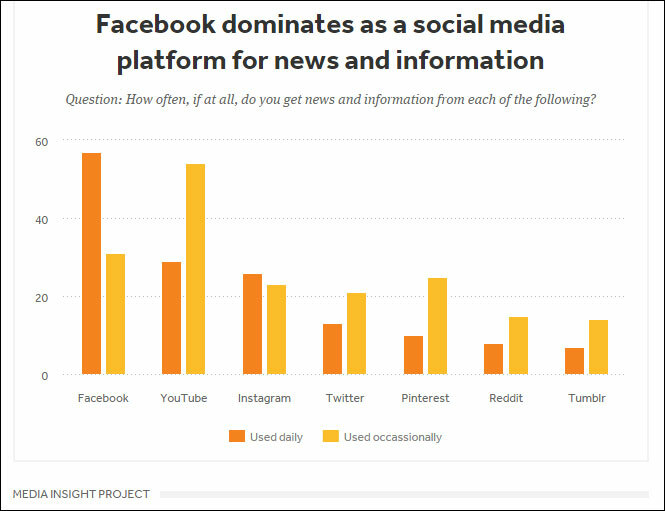 See, for example, “Ideological Segregation and the Effects of Social Media on News Consumption.” A March 2015 report from the Pew Research Center, “Local News in a Digital Age,” looks at the news ecosystems across three cities — Denver, Colo.; Macon, Ga.; and Sioux City, Iowa. Also see a 2015 report from Harvard University’s Berkman Center for Internet & Society, “Youth and Online News: Reflections and Perspectives”; and a Charlotte Observer project to engage younger audience members. Citation: “How Millennials Get News: Inside the Habits of America’s First Digital Generation,” Media Insight Project, March 2015, American Press Institute and the Associated Press/NORC Center for Public Affairs Research.